No one likes to pay more for products or services than they have to. That’s why online price comparison tools have become so popular. People don’t always have the time to visit different retailers to compare prices or seek out coupons. They may also not be able to wait until a deal is advertised. Price comparison tools make it quite simple for you to find the best deals by using websites and apps. Whether you want to compare the prices of groceries, electronics or flights, there’s a tool that can help you. While many companies have launched an online price checker, not all are the same. When you are looking for the best one for you, consider the range of retailers and products, search and filter capabilities, and ease of use. Click here for a comprehensive list of money-saving apps you should use when shopping. Price comparison systems are not perfect. That’s why it’s recommended that you use more than one tool if you want to make sure you get the best price on any item. Most of the top price comparison sites use data feeds to get their information from merchants. These files are prepared by the merchants who make them available to these sites in an effort to boost their sales. This means the comparison sites only get the information merchants want them to have and sellers may not include all their products. They may not send information on products with high margins or those that are very popular. Different retailers may also provide varying product names and descriptions, making it difficult to know if two products are actually the same. You, therefore, can’t be absolutely certain that every search will return the absolute best prices.You should also keep in mind that some sites and apps focus on specific product categories while others are more general. Some only feature listings from retailers who officially partner with them. Sites also vary based on whether shipping costs and taxes are included in the display price. Despite all these caveats, you have nothing to lose by comparing prices online before you make your purchase. It’s certainly easier than visiting multiple websites individually and there’s always the likelihood that you will save money. Let’s look at 13 of the best price finders you can use. Get extra money for your purchases by using SurveyJunkie. Sign up today. As you know, Google is an expert at pulling data from around the web and making it easily available to you. To use Google Shopping, all you need to do is search for the product you want using the regular search engine. The results appear either on the main results page or under the shopping tab. When you click on an item, not only will you see prices from several retailers, but you’ll get a description of the product and see customer reviews. Google Shopping with automatically show you the lowest price but if you don’t want to use that retailer, you can expand the list to see a full table with comparisons. If you want to buy refurbished or used items, you can easily to choose to see these results. Since you probably already use Google to begin your product search, why not also make shopping easier by using the price comparison feature? BizRate has been around since 1996 and it is easy to use. It may not be as robust as Google Shopping, but it can still help you to find some of the best deals. The site allows you to compare deals and read reviews to help you make your choice. From home décor to apparel, furniture, and tableware, you can find many of the everyday items you need among the millions of products, brands, and stores. You can narrow search results by price range, brand, seller, color, and other criteria. When you use BizRate, you get all the information you need to make a sound purchasing decision. Get cash back on a range of purchases when you shop through Ebates for even more savings. Yahoo Shopping is another simple online price comparison tool. You simply search for the item you want and choose from the matches that the search engine returns. The results come from more than 800 online retailers across a range of categories including flowers and gifts, music, beauty, computers, and sporting goods. If you’re not quite sure what you want, you can simply browse through dozens of categories to see what is available. Yahoo Shopping provides a clean user interface with lots of criteria for narrowing down available products. Pricegrabber operates in a similar way and it has millions of products from which you can choose. You can compare products and services across several categories including books and magazines, cell phones, clothing, and cameras. You have access to thousands of sellers ranging from Walmart, Office Depot, and Best Buy to small local merchants and retailers who don’t have their own website. If you sign up for Pricegrabber’s weekly newsletter, you get notified of discounts, deals, and popular new items. This means you can stay on top of all the best prices even when you aren’t looking for a specific product. Save on millions of products by comparing prices on Pricegrabber. This is another one of the best price finders. Shopping.com is part of the eBay Commerce Network. It gives you access to millions of products from thousands of retailers including big brands like Guess, Sony, Rayban, and Bosch. The search tools are simple to use and you benefit from several reviews and ratings of both products and merchants. Like other top price comparison sites, shopping.com helps you to save time and money. If you’re shopping for hotel accommodation, you should consider this app. You can search by the city, address or landmark you want to get the best price on accommodation. Trivago then compares more than 1.8 million hotels worldwide from in excess of 180 booking sites. If you’re booking a hotel at the last minute, you can search by your current location to find properties close to you. You can also read reviews from multiple sites. Another option is to choose properties by criteria like price, rating, availability of breakfast, beach access, and spa facilities. Since Trivago is a mobile app, you can do all your booking on the go. Download these apps today and begin earning money from your phone. InvisibleHand is a web browser add-on for Firefox, Chrome, and Safari. This price comparison tool covers shopping, flights, rental cars, and hotels. Supported retailers include Best Buy, buy.com, and Sears while hundreds of airlines are listed. InvisibleHand is still in beta and other retailers are expected to be added. The name is based on the fact that it is unobtrusive, but it notifies you when there is a deal on a product you are shopping for. The notification includes a link to the site with the lower price. Every time you use InvisibleHand, it refreshes to give you real-time prices. It also automatically looks for lower prices when you search for flights. In addition, when you Google a product, the add-on automatically shows you the lowest prices. InvisibleHand is great if you want to get the best prices but you don’t want to take any additional steps. Looking for more ways to round up your income? Check out this article. This online price checker is a little different from the others. So far, we’ve only looked at price comparison tools that compare multiple sites before you make a purchase. The Walmart Savings Catcher operates more like a cash back system. The process starts when you buy something at an eligible Walmart store with Walmart Pay. You then send your eReceipt to Savings Catcher from the Walmart Pay confirmation page or the Savings Catcher dashboard. The program assesses the prices of items you bought against those of local retailers in your area as published in weekly print and digital ads. If it finds a lower advertised price for the exact item, you get the difference on an eGift Card. You’re usually notified within a week about whether a lower price was found. You can use the card to make purchases instore or online. If you are a frequent Walmart shopper, this is one of the price comparison tools for you. Click here to find out how you can win cash prizes just by meeting your savings goals with Long Game. PriceRunner is a price comparison tool that lets you search and compare more than a million products from 3,000 retailers. It has been in operation since 2000 and it covers a large number of product categories including gaming, photography, phones, and sports and outdoor. PriceRunner compares products from both online and brick-and-mortar stores so you can make sure you’re really getting the best deal. In addition to giving you access to product reviews on varying retailers’ websites, PriceRunner produces its own reviews after testing products and services. So far, this has been done for things like action cameras and baby bouncers. The testers are experienced evaluators who check to see whether products work in the way they’re supposed to. 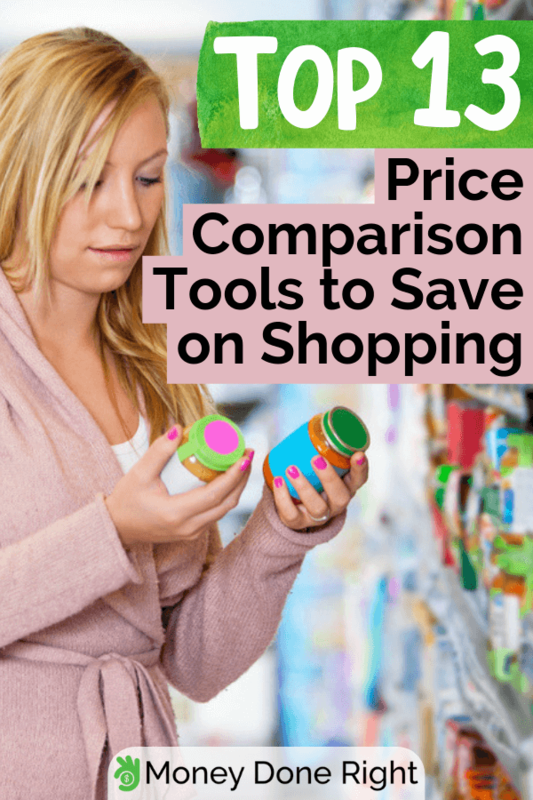 This is another one of the price comparison tools you should consider using when you do your shopping. Using the ShopSavvy app, you scan barcodes while in a store and see the prices both online and in physical storefronts. ShopSavvy also gives you the opportunity to set up notifications for specific items or categories. If there’s a sale or a store has restocked an item, you find out instantly. ShopSavvy has been downloaded over 100 million times and it gets over 50 million scans each month. The app is available for iOS, Android, and Windows Phone. There is also a Google Chrome browser extension that helps you find low prices at most major retailers. Looking for more ways to save on groceries? We’ve got you covered – click here. Pricepirates allows you to see prices from in-progress auctions on eBay, Amazon Marketplace offers and Shopping.com. There are apps available for iOS, Android, MacOS, and Windows. Pricepirates has an extensive catalog of products which means you are likely to find something you want even if you’re not looking for anything specific. However, you can set up a watch list if you want to keep track of certain offers. Pricepirates is a quick and simple online price checker perfect for people who do a lot of shopping on Amazon and eBay. The app shows you the best prices from popular sites like Amazon, Target, Sam’s Club, and FragranceX.com. You can also use the app to scan barcodes and QR codes and find the lowest price. BuyVia conveniently allows you to select the categories of products you’re most interested in and get notifications when they’re on sale. You can also set up price alerts for specific items, so you don’t miss any opportunity to get the products you want at a low price. This comes in handy if you don’t need a product immediately and you are willing to wait until there is a price reduction. BuyVia sometimes has options that other price comparison tools might not, so you have a wide range from which to choose. Did you know you can earn money by losing weight? Click here to get started with HealthyWage. ShopMania is another price comparison app which allows you to make informed decisions when you shop. It lets you see the online deals and promotions which are available in your country. As with other price comparison tools, you can browse several product categories or search for specific products which you need. You can choose from a wide range of items including jewelry, health and beauty, home and garden, and electronics. For even more ways to save money while shopping, check out our list of 99 money-saving apps and platforms. What price comparison tools do you use when you do your shopping? Are there any good tools we missed?